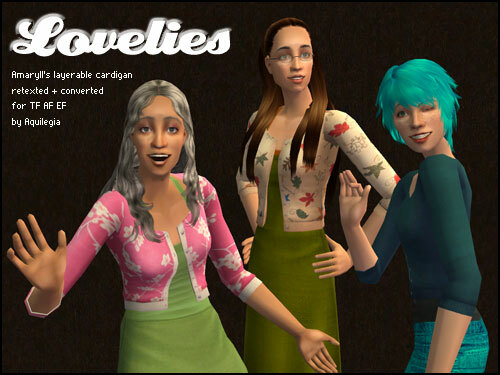 Eight retextures of Amaryll's layerable granny cardigan and two conversions (for TF and EF). The cardigans are untuckable as well as bottom-dress and high-waist friendly (as you can see on the banner model who is wearing the Autumn Leaves cardigan). The conversions have fat morphs, and the recolors are texture referenced to the AF recolors (so you must keep the AF version for any other version you want to keep). All files are clearly labeled as to age and texture name. The elder mesh has a more lifted shape with thicker arms than Maxis normal. There is a PSD inside of the archive with base textures for the cardigan (but not the shirt underneath, as that's just Maxis). The layers are seperated so that you can have white/lighter buttons and differently colored/nonpatterned trim, and there is a knit texture overlay. Thank you so much for these! The new colours and patterns look awesome. I'm going to start making the defaults right away! Wonderful! Thank you for the recolours and the age conversion. You're welcome! There's never enough age conversions. Again, I fall at your feet in thanksgiving. I'm so glad my grannies get these. Not to mention the PSD as I have massive problems trying to do recolors. Thanks so much. These are great! I'm a sucker for retro patterns. I was just playing my game and I had the random urge to let you know how much I appreciate your pennies skins! They're matte enough to blend into a pseudo-maxis match game, yet they blend perfectly with more detailed nosemasks as well, making them good for more realistic games too! I also love the sort of blushy color in the cheeks. They have a sort of glow to them (while not looking oily) that really adds something. Much love for your creations. Aww, thank you! <3 I'm glad I can make pretties for others who share my aesthetics.